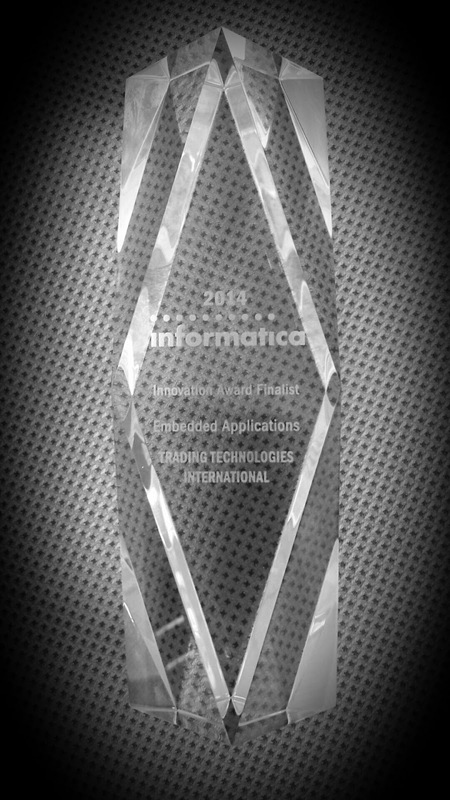 Last week Informatica hosted its annual customer conference, aptly named Informatica World 2014, where TT was recognized as an Innovation Award Finalist. I was lucky enough to attend the conference and accept the award on behalf of TT. Although these types of vendor-sponsored awards are typically just marketing exercises for all involved, this was a different experience in my opinion. After speaking with various groups within Informatica, including their marketing team, as well as other conference attendees, it was obvious there was a genuine interest in and recognition of the innovation going into the development of TT’s recently unveiled next-generation trading platform. I didn’t expect people to be very interested in us because we’re not a giant global enterprise like the typical Informatica customer. Informatica provides data integration software and services to a client roster that includes some of the most widely recognized companies in the world. Their products include the Ultra Messaging (UM) product suite, which we’re using in the new TT platform. In retrospect though, I guess the response shouldn’t have been so surprising since the conference was heavily focused on cloud and big data. In particular, many discussions focused on the challenges of getting real-time data into cloud-based data warehouses; we faced similar challenges when designing the new platform. UM is an innovative product in its own right. Designed to address the requirements of messaging middleware for financial trading platforms, the UM product suite offers very low latency, support for multiple transport protocols including multicast, shared-memory inter-process communication, guaranteed message delivery and efficient routing. By leveraging UM, TT can focus on delivering critical trading platform innovations to its customers. A software-as-a-service (SaaS) solution, the new TT platform leverages the Internet and cloud to provide a highly scalable and cost-effective trading platform without sacrificing performance. With a very similar look and feel to our X_TRADER® client application, users will manage all of their trading activity through the web-based front end, but do so in a much more flexible way. Our customers will be able to access the application, their saved workspaces and their data from virtually any Internet-connected computer workstation or mobile device. The new platform is designed to provide the operational flexibility to host the back-end components of the platform on infrastructure that provides users with the best cost/performance benefit. Moreover, the modular design inherently supports graceful failover and disaster recovery as well as the ability to scale out capacity in the highly elastic cloud when user demand exceeds the capacity of dedicated infrastructure. Performance is maintained by partitioning the platform’s functionality between trade execution and trade management. In the new TT platform, the trade execution functionality, which includes market data normalization, trade decision computations and logic evaluations, risk checking and order routing, occurs on dedicated infrastructure colocated in the same data centers that host the exchange matching engines. The supporting trade management functionality, such as persistence of order book state and audit trails, user administration, risk management and client connectivity, is hosted in lower-cost private infrastructure or in the cloud, not in colocation. Informatica’s UM is a key facilitator of this architecture, providing process communication between the various components of the solution regardless of whether these components are hosted in a colocation data center or in the cloud. Products like Informatica’s Ultra Messaging are innovation enablers. In part, by leveraging a reliable, high-performance messaging solution out of the box, TT is able to focus on innovating on its core value proposition, delivering professional trading tools, high-performance execution and market expansion to our users. Thanks, Informatica, for recognizing TT as an innovator. I guess it takes one to know one.